[/vc_column_text][/vc_column][/vc_row][vc_row][vc_column width=”1/2″][vc_single_image image=”6023″ img_size=”large”][/vc_column][vc_column width=”1/2″][vc_column_text] Black Burned Blimp by Black Burned Blimp [/vc_column_text][vc_column_text]The Black Burned Blimp EP. A guest blog by Freek Philippi on how we did the recording of this ep. Recorded at White Noise Studio by Marlon Wolterink and Freek Philippi. Mix and master by Freek Philippi. 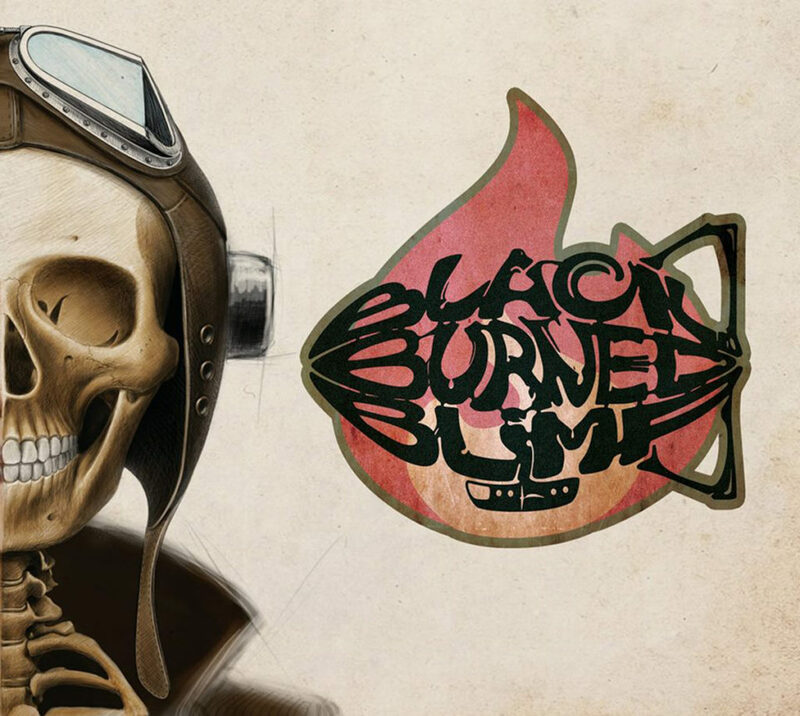 Last week the new Black Burned Blimp EP was released. The EP, containing 4 BBB songs, was recorded last December at the White Noise Studio by Marlon Wolterink and me and mixed/mastered in my studio. Marlon asked me if i’d like to write a studio blog about it, about what gear was used for the recording, of course, so hey ho…..
Black Burned Blimp is a 4 piece band led by the Broers Brothers, Eric (vocals, guitar) and Arjan (drums) and is completed with Jurjen on bass and Michaël on lead guitar. Having heard the demos Eric made we booked 2 days for recording the 4 songs, which meant we had enough time to get into the details and spend some time experimenting with things like pedals and background vocals. After a much needed cup of coffee we started with setting up the drumkit and mic’ing the kit and room. Arjan played on the White Noise Studio’s Pearl Masterworks kit, complimented with his own cymbals and his Pearl Chad Smith signature snare. The kick drum was mic’ed with a SENnheiser (aha Marlon!) MD421 on the inside of the kick and an AKG D112 in the sound hole in the resonant skin. The first one delivers a dry, close, attack sound and the second one catches the low end and deepness of the kickdrum. Both mics where routed through Universal Audio 6176’s preamps. These are tube preamps / compressors which give a nice round full sound. We used the preamp part of those, the compressors were bypassed. The snare was recorded with shure sm57’s on top and bottom. They where routed through my Api 512c preamps which give them a forward, urgent sound. For overheads we used 2 Neumann km184’s, which went through the mic preamps of the studio’s D&R Stylyx console. In addition to the left and right overhead, we used an SE Electronics 4400a as a third overhead mic. The microphone was placed right in the middle over the snaredrum. The racktom and floortom were recorded with Sennheiser Md421’s and the room was recorded with an Neumann TLM 103 and a BPM CR76 tune mic. The ride was recorded with a rode NT5 and the hihat was recorded with a sm58, which rounded off some of the top frequenties. In this case that was a good thing. All these mics went through the preamps of the D&R Stylyx mixing desk. Arjan played along with a click track and Eric’s guide guitar. The guide guitar was DI’d in the control room. After warming up, we recorded 2 or 3 drum takes per song and selected the best take for each song. Bass time! We removed the mics and drumkit from the live room and we set up the bass amp. Jurjen played an Epiphone Thunderbird through a Fender Rumble 500 amp. The bass was recorded with an Electro Voice RE20 which gives a very consistent sound across the whole frequency spectrum. It was routed through the UA6176, for some tube mojo. For the rhythm guitar we set up my Fender Twin Reverb. This amp works really well with pedals, and Eric is a pedal man. Or banana man? We tried out a a number of pedals before we settled with a Big Muff type for the normal rhythm parts, a Boss DS-1 for the extra chorus push and the Boss OD-1 for the Crunch parts in the song “Earthley Tether”. Eric played a Fender Telecaster, tuned to C with a fairly thick string cauge. The amp was mic’ed with a sm57 on each 12″ Jensen speaker, and went through the API pre’s. Michaël’s lead guitar parts where also recorded with the Fender Twin Reverb. He alternated between a telecaster and a Gretsch and played mostly with a Big Muff sound. The lead part in the first half of “Earthley Tether” is a velcro type fuzz. We tested out the BPM CR76 a Neumann TLM 103 and an Electro Voice RE20 before settling on the RE20, or as Eric likes to call it: the Radiohead Basement Mic. For Eric’s Voice, the BPM CR76 was too detailed, the TLM 103 too hifi and the RE20 just right. So we went with the RE20. We tried out a couple of preamps before we recorded it throught the API 512c. We did vocals and backing vocals and experimented with the background vocal arrangements. Hey hey heeeey, after that we hooked up the synths. They went straight into the desk.